On our free walking tour of Copenhagen, our British guide Roger stood in front of the Magasin department store on Kongens Nytorv, explaining how it used to be a hotel, renting rooms out to the likes of Hans Christian Anderson who lived there when he first moved to Copenhagen to try breaking into the theatre as an actor. That little pub turned out to be Hviids Vinstue – I won’t pretend to know how to pronounce the name, but I venture that it’s probably something like “Hivi Vins”, as the Danish seem to swallow the second half of all their words! Hviids Vinstue in winter is very different to what it’s like in summer – in winter they boast about having Denmark’s best festive glogg drink, and in summer, the pavement outside the pub is lined with tables and chairs for customers to enjoy a glass of beer out in the sunshine. The beer of choice in Hviids Vinstue is Tuborg, the competitor to Denmark’s more famous Carlsberg beer. We were told by our guide that one’s choice of beer becomes a real point of contention in Denmark as one always has an allegiance to one of the two premium brands. This stems back to times when almost everyone in Copenhagen had a relative who worked for either one of the brands, and he told a story where he turned up at his friend’s house with a 6-pack of Tuborg, only for his friend’s grandfather to insist that he leave it outside as he was a life-long Carlsberg employee. 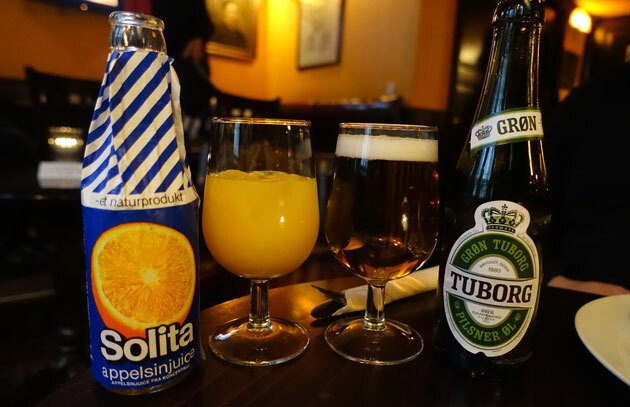 Having tried both beers, K doesn’t really have any allegiance to either – in his words, Tuborg is just as drinkable as Carlsberg. Clearly he would never become a true Copenhagener. The lunch offer is for one drink (beer for K, orange juice for me) with three assorted smorrebrod of the pub’s choice. Luckily, our waiter brought out six different smorrebrod for us, so that we could try a bit of everything. 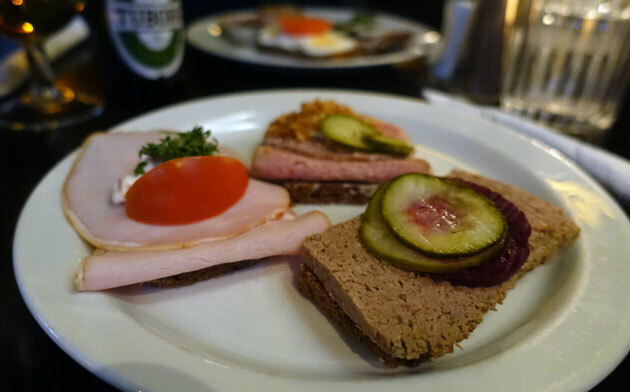 On this plate, the pate and pickle smorrebrod was probably my pick – the savoury meaty pate was set off particularly well by the sweet and salty pickle. Of the other three smorrebrod, the fish ceviche smorrebrod was probably my favourite. The ceviche was served in a little silver patty case next to the brod, so it’s an ‘assemble your own smorrebrod’ situation. I thought the sourness and freshness of the ceviche was really more-ish, and much more memorable than the boring boiled egg and tomato combination. 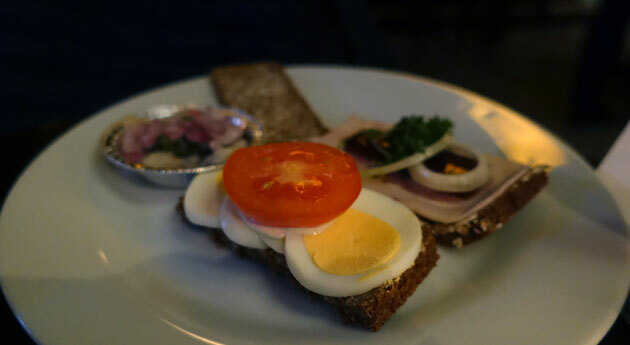 Overall, if you’re looking for a pretty standard Danish smorrebrod lunch experience, Hviids Vinstue on Kongens Nytorv offers a great value lunch in a central part of Copenhagen. 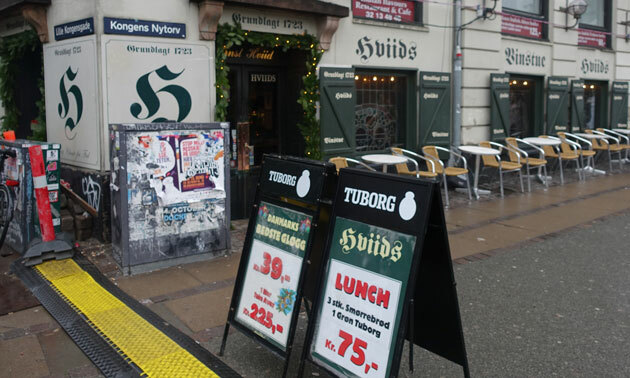 It’s probably the best value lunch you’ll find – certainly much cheaper than most other meals in expensive Copenhagen. The only thing that beats it on price and authenticity is a hotdog from a Danish hotdog stand…and that I’m saving for my next blog entry! Hviids Vinstue is located at 19 Kongens Nytorv, Copenhagen.